Many banks face a climate data gap in identifying the energy technology exposure of the companies in their lending portfolios. That’s pretty serious, as in the next five years, carbon-intensive firms in those portfolios plan to produce more internal-combustion engines and coal-fired power than the maximum the International Energy Agency (IEA) has determined is compatible as outlined within the Paris Agreement. In December, 2015, 195 countries set a long-term goal of keeping the increase in global average temperature to well below 2°C above pre-industrial levels. Investor patterns that disregard the 2°C levels prompt talk of a “carbon bubble”— overvaluation of businesses when climate-related risk is failed to be factored into profitability statement predictions. 2° Investing Initiative, a think-tank that conducted climate stress tests for Swiss and Californian regulators, says that global equity and corporate-bond markets also look dangerously exposed to energy-transition risk. The think-tank offers an example of this exposure with the debt in the oil and gas sector, which has increased by >50% for some companies in the past 2-3 years. Moreover, the 2° Investing Initiative reminds us that investment plans in renewable energy and electric vehicles lag behind the IEA’s projections of what is needed. In a white paper titled, “Committed Emissions from Existing and Planned Power Plants and Asset Stranding Required to Meet the Paris Agreement,” Pfeiffer and colleagues outline how, over the coming decade, the power sector is expected to invest $~7.2 trillion in power plants and grids globally, much of it into CO2-emitting coal and gas plants. These assets typically have long lifetimes and commit large amounts of (future) CO2 emissions. Such long lifetimes mean that any investment made today in CO2 emitting infrastructure will have a considerable effect on the ability to achieve required CO2 emission reductions in the future — even if these desired reductions are many years away. Committed emissions are the cumulative emissions an asset would emit over its remaining lifetime under normal economic conditions, such as if it were to be operated at normal utilization. Pfeiffer and co-authors argue that, even though the growth of emission commitments has slowed down in recent years, currently operating generators still commit to emissions (~300 GtCO2) above the levels compatible with the average 1.5 °C–2 °C scenario (~240 GtCO2). Furthermore, the researchers say, the current pipeline of power plants would add almost the same amount of additional commitments (~270 GtCO2). Even if the entire pipeline was cancelled, ~20% of global capacity would need to be stranded to meet the climate goals set out in the Paris Agreement. In essence, Pfeiffer, et al determined that electricity producers would have to retire a fifth of capacity and cancel all planned projects if the Paris goals are to be met. In February, 2018, the US General Accounting Office (GAO) reviewed efforts to implement the Securities and Exchange Commission (SEC) “Guidance Regarding Disclosure Related to Climate Change 2010.” The 2010 Guidance was SEC’s primary form of communication to clarify companies’ climate-related disclosure requirements. In particular, the 2018 review committee recommended that companies include material climate-related disclosures in their public filings and encouraged standard-setting bodies to support adoption of the recommendations. The GAO also acknowledged that the SEC faces constraints in reviewing climate-related and other disclosures because it primarily relies on information that companies provide. Representatives of industry associations told GAO that they consider the current climate-related disclosure requirements adequate and no additional climate-related disclosures were needed. However, some investor groups and asset management firms have highlighted the need for companies to disclose more climate-related information. But, members of SEC’s Investor Advisory Committee told GAO that investors have not agreed on the priority of climate-related disclosures. Other efforts to persuade companies to disclose climate-related risk are also underway. The Task Force on Climate-Related Financial Disclosures (TCFD) commissioned by Mark Carney, governor of the Bank of England and chair of the G20’s Financial Stability Board, is asking companies to report on their response to the risks and opportunities created by climate change. Governance. Disclose the organization’s governance around climate-related risks and opportunities. Strategy. Disclose the actual and potential impacts of climate-related risks and opportunities on the organization’s businesses, strategy, and financial planning where such information is material. Risk Management. Disclose how the organization identifies, assesses, and manages climate-related risks. Metrics and Targets. Disclose the metrics and targets used to assess and manage relevant climate-related risks and opportunities where such information is material. 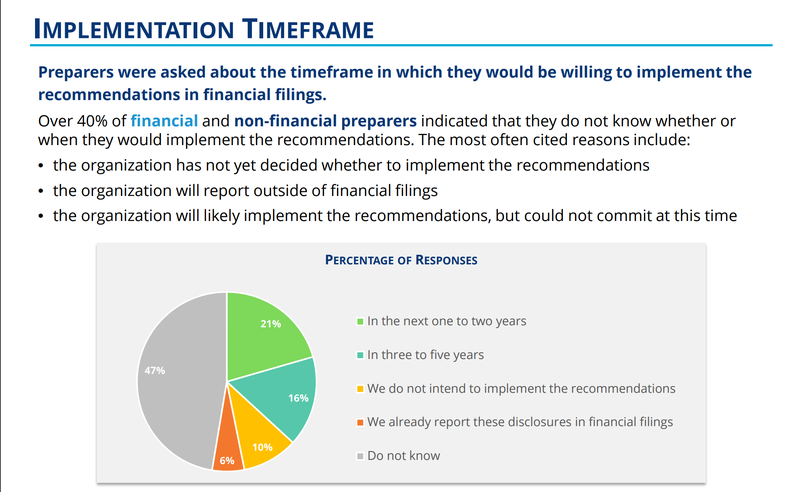 MIT Sloan suggests there are several reasons why companies should start implementing the TCFD recommendations. Investors need this information and are mobilizing to ensure companies take the recommendations seriously. Investors may be less inclined to invest in companies that do not implement the recommendations. Companies that comply with the recommendations will have better strategies for adapting to climate change and will be better able to explain these to the investment community. The recommendations will likely lead to regulation; laggards will find themselves playing catch-up, perhaps under time pressure and great expense if they’ve done nothing to lay the groundwork for following the TCFD’s recommendations. A gap exists between the way companies identify climate-related risks and opportunities and how they are preparing to tackle them. The stakes are high for investors, companies, and the world. Yes, some companies and their attorneys have concerns that climate-related risk scenario analysis could be interpreted as a forecast, and, if proved inaccurate, could lead to being sued by investors. But the way that companies deal with climate-related risk will be important as climate events like Superstorm Sandy continue to accrue significant costs for municipalities. Companies must prove they can deliver value for its investors — and the world at large.